For other uses, see Rope (disambiguation). A rope is a group of yarns, plies, fibers or strands that are twisted or braided together into a larger and stronger form. Ropes have tensile strength and so can be used for dragging and lifting. Rope is thicker and stronger than similarly constructed cord, string, and twine. Rope may be constructed of any long, stringy, fibrous material, but generally is constructed of certain natural or synthetic fibres. Synthetic fibre ropes are significantly stronger than their natural fibre counterparts, they have a higher tensile strength, they are more resistant to rotting than ropes created from natural fibers, and can be made to float on water. But synthetic rope also possess certain disadvantages, including slipperiness, and some can be damaged more easily by UV light. Common natural fibres for rope are manila hemp, hemp, linen, cotton, coir, jute, straw, and sisal. Synthetic fibres in use for rope-making include polypropylene, nylon, polyesters (e.g. PET, LCP, Vectran), polyethylene (e.g. Dyneema and Spectra), Aramids (e.g. Twaron, Technora and Kevlar) and acrylics (e.g. Dralon). Some ropes are constructed of mixtures of several fibres or use co-polymer fibres. Wire rope is made of steel or other metal alloys. Ropes have been constructed of other fibrous materials such as silk, wool, and hair, but such ropes are not generally available. Rayon is a regenerated fibre used to make decorative rope. The twist of the strands in a twisted or braided rope serves not only to keep a rope together, but enables the rope to more evenly distribute tension among the individual strands. Without any twist in the rope, the shortest strand(s) would always be supporting a much higher proportion of the total load. The long history of rope means that many systems have been used to state the size of a rope. 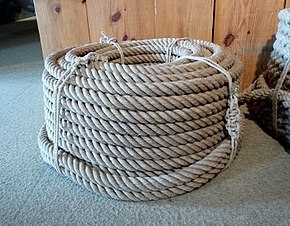 In systems that use the "inch" (British Imperial and United States Customary Measure), large ropes over 1 inch diameter such as are used on ships are measured by their circumference in inches; smaller ropes have a nominal diameter based on the circumference divided by three (rounded-down value for pi). In metric systems of measurement, nominal diameter is given in millimetres. The current preferred international standard for rope sizes is to give the mass per unit length, in kilograms per metre. However, even sources otherwise using metric units may still give a "rope number" for large ropes, which is the circumference in inches. Rope is of paramount importance in fields as diverse as construction, seafaring, exploration, sports, theatre, and communications, and has been used since prehistoric times. 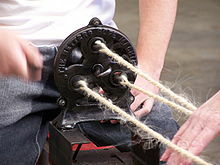 To fasten rope, many types of knots have been invented for countless uses. Pulleys redirect the pulling force to another direction, and can create mechanical advantage so that multiple strands of rope share a load and multiply the force applied to the end. Winches and capstans are machines designed to pull ropes. Dynamic Kernmantle rock climbing rope with its braided sheath cut to expose the twisted core yarns and core yarn plies. The modern sport of rock climbing uses so-called "dynamic" rope, which stretches under load in an elastic manner to absorb the energy required to arrest a person in free fall without generating forces high enough to injure them. Such ropes normally use a kernmantle construction, as described below. "Static" ropes, used for example in caving, rappelling, and rescue applications, are designed for minimal stretch; they are not designed to arrest free falls. The UIAA, in concert with the CEN, sets climbing-rope standards and oversees testing. Any rope bearing a GUIANA or CE certification tag is suitable for climbing. Despite the hundreds of thousands of falls climbers suffer every year, there are few recorded instances of a climbing rope breaking in a fall; the cases that do are often attributable to previous damage to, or contamination of, the rope. Climbing ropes, however, do cut easily when under load. Keeping them away from sharp rock edges is imperative. Rock climbing ropes come with either a designation for single, double or twin use. A single rope is the most common and it is intended to be used by itself, as a single strand. Single ropes range in thickness from roughly 9 mm to 11 mm. Smaller ropes are lighter, but wear out faster. Double ropes are thinner ropes, usually 9 mm and under, and are intended for use as a pair. These ropes offer a greater margin or security against cutting, since it is unlikely that both ropes will be cut, but they complicate belaying and leading. Double ropes are usually reserved for ice and mixed climbing, where there is need for two ropes to rappel or abseil. They are also popular among traditional climbers, and particularly in the UK, due to the ability to clip each rope into alternating pieces of protection; allowing the ropes to stay straighter and hence reduce rope drag. Twin ropes are not to be confused with doubles. When using twin ropes, both ropes are clipped into the same piece of protection, treating the two as a single strand. This would be favourable in a situation where there was a high chance of a rope being cut. However new lighter-weight ropes with greater safety have virtually replaced this type of rope. The butterfly coil is a method of carrying a rope used by climbers where the rope remains attached to the climber and ready to be uncoiled at short notice. Another method of carrying a rope is the alpine coil. Rope is also an aerial acrobatics circus skill, where a performer makes artistic figures on a vertical suspended rope. Tricks performed on the rope are, for example, drops, rolls and hangs. They must also be strong. See also Corde lisse. The use of ropes for hunting, pulling, fastening, attaching, carrying, lifting, and climbing dates back to prehistoric times. It is likely that the earliest "ropes" were naturally occurring lengths of plant fibre, such as vines, followed soon by the first attempts at twisting and braiding these strands together to form the first proper ropes in the modern sense of the word. Impressions of cordage found on fired clay provide evidence of string and rope-making technology in Europe dating back 28,000 years. Fossilized fragments of "probably two-ply laid rope of about 7 mm diameter" were found in one of the caves at Lascaux, dating to approximately 15,000 BC. 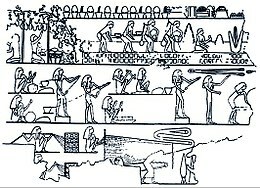 The ancient Egyptians were probably the first civilization to develop special tools to make rope. Egyptian rope dates back to 4000 to 3500 B.C. and was generally made of water reed fibres. Other rope in antiquity was made from the fibres of date palms, flax, grass, papyrus, leather, or animal hair. The use of such ropes pulled by thousands of workers allowed the Egyptians to move the heavy stones required to build their monuments. Starting from approximately 2800 B.C., rope made of hemp fibres was in use in China. Rope and the craft of rope making spread throughout Asia, India, and Europe over the next several thousand years. In the Middle Ages (from the 13th to the 18th centuries), from the British Isles to Italy, ropes were constructed in ropewalks, very long buildings where strands the full length of the rope were spread out and then laid up or twisted together to form the rope. The cable length was thus set by the length of the available rope walk. This is related to the unit of length termed cable length. This allowed for long ropes of up to 300 yards long or longer to be made. These long ropes were necessary in shipping as short ropes would require splicing to make them long enough to use for sheets and halyards. The strongest form of splicing is the short splice, which doubles the cross-sectional area of the rope at the area of the splice, which would cause problems in running the line through pulleys. Any splices narrow enough to maintain smooth running would be less able to support the required weight. Leonardo da Vinci drew sketches of a concept for a ropemaking machine, but it was never built. Nevertheless, remarkable feats of construction were accomplished without advanced technology: In 1586, Domenico Fontana erected the 327 ton obelisk on Rome's Saint Peter's Square with a concerted effort of 900 men, 75 horses, and countless pulleys and meters of rope. By the late 18th century several working machines had been built and patented. Some rope is still made from natural fibres, such as coir and sisal, despite the dominance of synthetic fibres such as nylon and polypropylene, which have become increasingly popular since the 1950s. Laid rope, also called twisted rope, is historically the prevalent form of rope, at least in modern Western history. 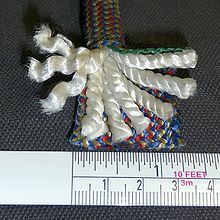 Common twisted rope generally consists of three strands and is normally right-laid, or given a final right-handed twist. The ISO 2 standard uses the uppercase letters S and Z to indicate the two possible directions of twist, as suggested by the direction of slant of the central portions of these two letters. The handedness of the twist is the direction of the twists as they progress away from an observer. 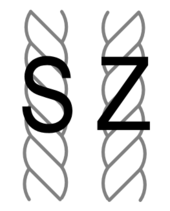 Thus Z-twist rope is said to be right-handed, and S-twist to be left-handed. Twisted ropes are built up in three steps. First, fibres are gathered and spun into yarns. 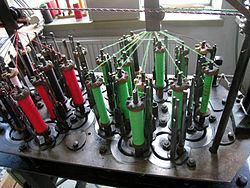 A number of these yarns are then formed into strands by twisting. The strands are then twisted together to lay the rope. The twist of the yarn is opposite to that of the strand, and that in turn is opposite to that of the rope. It is this counter-twist, introduced with each successive operation, which holds the final rope together as a stable, unified object. 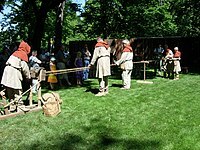 Traditionally, a three strand laid rope is called a plain- or hawser-laid, a four strand rope is called shroud-laid, and a larger rope formed by counter-twisting three or more multi-strand ropes together is called cable-laid. Cable-laid rope is sometimes clamped to maintain a tight counter-twist rendering the resulting cable virtually waterproof. Without this feature, deep water sailing (before the advent of steel chains and other lines) was largely impossible, as any appreciable length of rope for anchoring or ship to ship transfers, would become too waterlogged – and therefore too heavy – to lift, even with the aid of a capstan or windlass. One property of laid rope is partial untwisting when used. This can cause spinning of suspended loads, or stretching, kinking, or hockling of the rope itself. An additional drawback of twisted construction is that every fibre is exposed to abrasion numerous times along the length of the rope. This means that the rope can degrade to numerous inch-long fibre fragments, which is not easily detected visually. Twisted ropes have a preferred direction for coiling. Normal right-laid rope should be coiled clockwise, to prevent kinking. Coiling this way imparts a twist to the rope. Rope of this type must be bound at its ends by some means to prevent untwisting. 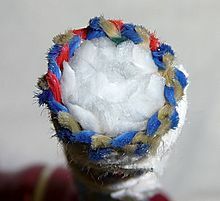 While rope may be made from three or more strands, modern braided rope consists of a braided (tubular) jacket over strands of fiber (these may also be braided). Some forms of braided rope with untwisted cores have a particular advantage; they do not impart an additional twisting force when they are stressed. The lack of added twisting forces is an advantage when a load is freely suspended, as when a rope is used for rappelling or to suspend an arborist. Other specialized cores reduce the shock from arresting a fall when used as a part of a personal or group safety system. Braided ropes are generally made from nylon, polyester, polypropylene or high performance fibers such as high modulus polyethylene (HMPE) and aramid. Nylon is chosen for its strength and elastic stretch properties. However, nylon absorbs water and is 10–15% weaker when wet. Polyester is about 90% as strong as nylon but stretches less under load and is not affected by water. It has somewhat better UV resistance, and is more abrasion resistant. Polypropylene is preferred for low cost and light weight (it floats on water) but it has limited resistance to ultraviolet light, is susceptible to friction and has a poor heat resistance. Braided ropes (and objects like garden hoses, fibre optic or coaxial cables, etc.) that have no lay (or inherent twist) uncoil better if each alternate loop is twisted in the opposite direction, such as in figure-eight coils, where the twist reverses regularly and essentially cancels out. Single braid consists of an even number of strands, eight or twelve being typical, braided into a circular pattern with half of the strands going clockwise and the other half going anticlockwise. The strands can interlock with either twill or plain weave. The central void may be large or small; in the former case the term hollow braid is sometimes preferred. Double braid, also called braid on braid, consists of an inner braid filling the central void in an outer braid, that may be of the same or different material. Often the inner braid fibre is chosen for strength while the outer braid fibre is chosen for abrasion resistance. In solid braid, the strands all travel the same direction, clockwise or anticlockwise, and alternate between forming the outside of the rope and the interior of the rope. This construction is popular for general purpose utility rope but rare in specialized high performance line. Kernmantle rope has a core (kern) of long twisted fibres in the center, with a braided outer sheath or mantle of woven fibres. The kern provides most of the strength (about 70%), while the mantle protects the kern and determines the handling properties of the rope (how easy it is to hold, to tie knots in, and so on). In dynamic climbing line, core fibres are usually twisted, and chopped into shorter lengths, which makes the rope more elastic. Static kernmantle ropes are made with untwisted core fibres and tighter braid, which causes them to be stiffer in addition to limiting the stretch. Plaited rope is made by braiding twisted strands, and is also called square braid. It is not as round as twisted rope and coarser to the touch. It is less prone to kinking than twisted rope and, depending on the material, very flexible and therefore easy to handle and knot. This construction exposes all fibres as well, with the same drawbacks as described above. Brait rope is a combination of braided and plaited, a non-rotating alternative to laid three-strand ropes. Due to its excellent energy-absorption characteristics, it is often used by arborists. It is also a popular rope for anchoring and can be used as mooring warps. This type of construction was pioneered by Yale Cordage. Endless winding rope is made by winding single strands of high-performance yarns around two end terminations until the desired break strength or stiffness has been reached. This type of rope (often specified as cable to make the difference between a braided or twined construction) has the advantage of having no construction stretch as is the case with above constructions. Endless winding is pioneered by SmartRigging and FibreMax. Sealing rope ends this way is lazy and dangerous. A tugboat operator once sliced the palm of his hand open down to the sinews after the hardened (and obviously sharp) end of a rope that had been heat-sealed pulled through his grasp. There is no substitute for a properly made whipping. If a load-bearing rope gets a sharp or sudden jolt or the rope shows signs of deteriorating, it is recommended that the rope be replaced immediately and should be discarded or only used for non-load-bearing tasks. The average rope life-span is 5 years. Serious inspection should be given to line after that point. However, the use to which a rope is put affects frequency of inspection. Rope used in mission-critical applications, such as mooring lines or running rigging, should be regularly inspected on a much shorter timescale than this, and rope used in life-critical applications such as mountain climbing should be inspected on a far more frequent basis, up to and including before each use. Avoid stepping on rope, as this might force tiny pieces of rock through the sheath, which can eventually deteriorate the core of the rope. 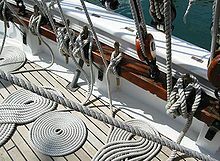 Ropes may be flemished into coils on deck for safety and presentation/tidiness as shown in the picture. Many kinds of filaments in ropes are weakened by acids or other corrosive liquids or solvents, and high temperatures. Such damage is treacherous because it often is hard to tell by eye. Rope damaged in such ways is dangerous to use. Ropes therefore should be kept away from all kinds of solvents and from corrosive acids, alkalis, and oxidising agents. In addition, ropes should avoid sudden load, as a shock load can destroy a rope easily. Any operation of ropes should obey the principle of safe working load, which is usually much less than its ultimate strength. The rope should be replaced immediately if any evidences of shock load have been found. A rope under tension – particularly if it has a great deal of elasticity – can be very hazardous if it should part, snapping backward and potentially causing grave or lethal injury to people, or damage to objects, in its path. There are occasions when it is proper to cut a taut rope under load, but this should be done only when necessary and only with great forethought and preparation for the potential consequences. "Rope" refers to the manufactured material. Once rope is purposely sized, cut, spliced, or simply assigned a function, the result is referred to as a "line", especially in nautical usage. Sail control lines are mainly referred to as sheets (e.g. jibsheet). A halyard, for example, is a line used to raise and lower a sail, and is typically made of a length of rope with a shackle attached at one end. Other examples include clothesline, chalk line, anchor line ("rode"), stern line, fishing line, marline and so on. ^ Jr, John V. Noel (1988-12-15). Knight's Modern Seamanship. John Wiley & Sons. ISBN 9780471289487. ^ Army Field Manual FM 5-125 (Rigging Techniques, Procedures and Applications) (PDF). Technical Manual No. 3-34.86/Marine Corps, Reference Publication 3-17.7J. The United States Army. 2012. ^ Carver, R.K. (2009). Stagecraft Fundamentals: A Guide and Reference for Theatrical Production. Focal Press. p. 250. ISBN 978-0-240-80857-4. Retrieved 15 November 2018. ^ Coles, A. (2009). Skipper's Onboard Knot Guide: Knots, Bends, Hitches and Splices. A&C Black. p. 3. ISBN 978-0-7136-8934-1. Retrieved 15 November 2018. ^ International Association of Fire Chiefs; National Fire Protection Association (2008). Fundamentals of Fire Fighter Skills. Jones & Bartlett Learning, LLC. p. 499. ISBN 978-0-7637-5342-9. Retrieved 15 November 2018. ^ ListVerse.com (November 2009). The Ultimate Book of Top Ten Lists: A Mind-Boggling Collection of Fun, Fascinating and Bizarre Facts on Movies, Music, Sports, Crime, Celebrities, History, Trivia and More. Ulysses Press. ISBN 978-1-56975-715-4. ^ "A Brief History of Rope: 8 Times Rope has Shaped the World – Ropes Direct". Ropes Direct. 2016-07-29. Retrieved 2017-06-13. ^ "Fedec | Resources". Archived from the original on January 31, 2014. Retrieved 2014-01-31. ^ J.C. Turner and P. van de Griend (ed. ), The History and Science of Knots (Singapore: World Scientific, 1996), 14. ^ J. Bohr and K. Olsen (2010). "The ancient art of laying rope". EPL. 93: 60004. arXiv:1004.0814. Bibcode:2011EL.....9360004B. doi:10.1209/0295-5075/93/60004. ^ McFarland, Cynthia (2013-08-06). HORSEMANS GT TACK & EQUIPMENT: F. Rowman & Littlefield. ISBN 978-0-7627-9598-7. ^ Kyosev, Y (2015). Braiding technology for textiles. Cambridge, UK Waltham, MA, USA: Elsevier/ Woodhead Pub. ISBN 978-0-85709-135-2. ^ "Rope & Fiber Comparison Guide"
^ Budworth, Geoffrey (1985). The Knot Book. New York: Sterling Publishing Co., Inc. p. 37. ISBN 0-8069-7944-5. ^ "Air Winch Safety Info". Retrieved 10 October 2012. ^ "Wire Rope Inspections". U.S. DOL, OSHA. Retrieved 10 October 2012. ^ Rope Care "How to Maintain Ropes"
^ National Research Council (U.S.) (1975). Mechanical Rope and Cable: Report of the Ad Hoc Committee on Mechanical Rope and Cable, National Materials Advisory Board, Commission on Sociotechnical Systems, National Research Council. National Academies. pp. 51–54. ^ American Telephone and Telegraph Company (1931). Use, Care, and Maintenance of Manila Rope and Blocks. Smith, Bruce & Padgett, Allen, 1996. On Rope. North American Vertical Rope Techniques, National Speleological Society, Huntsville, Alabama. Strunk, P.; Abels, J. Das große Abenteuer 2.Teil, Verlag Karl Wenzel, Marburg, 1986. Tyson, William, no date. Rope, a History of the Hard Fibre Cordage Industry in the United Kingdom, Wheatland Journals, Ltd., London. Bodmer, Rudolph John; Bodmer, Amelie Willard (1914). "Rope". The Book of Wonders: Gives Plain and Simple Answers to the Thousands of Everyday Questions that are Asked and which All Should be Able To, But Cannot Answer. Presbrey syndicate. pp. 353 onwards. Herkommer, Mark (1995). FM 5-125: Rigging Techniques, Procedures, and Applications. Washington, DC: United States Department of the Army. Wikimedia Commons has media related to Rope. Look up rope in Wiktionary, the free dictionary. Watch How Do They Braid Rope?